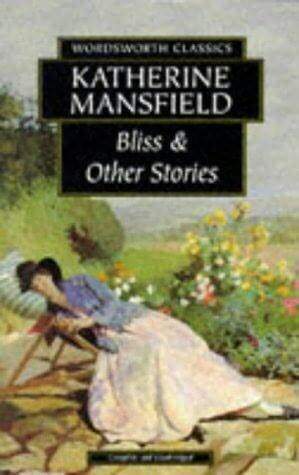 I’ve recently returned from the Katherine Mansfield Symposium, The ‘Underworld’ and the ‘Blooms Berries’, held at the RMIT University, Melbourne in conjunction with the Katherine Mansfield Society. Two days dedicated to a discussion of her life and short stories by a wide range of very passionate scholars, all bringing very different aspects of her work to the fore. I wondered, what Katherine would have thought, had she somehow dropped in at the Radio Theatre, RMIT on La Trobe Street, to eavesdrop upon the speakers. First, as I wandered down the wide pavements of Melbourne where the fat autumn leaves lay undisturbed, I marvelled at the difference and also the similarities between Wellington (birthplace of KM) and Melbourne, where the Symposium was being held. I don’t think Katherine ever visited Melbourne, but it occurred to me that she would have loved it (as it is now), so stylish, cultural, and definitely a place to find a classy tea shop. The sluggish brown Yarra is not quite Oriental Bay, but at night it springs to life reflecting the true nature and sophistication of this city, out-dazzling itself in a riot of bright lights reflected on its darkened inert surface. And, now finally, after a few visits to Melbourne over many years, I have (with the help of a local) discovered the grid. That Elizabeth and Swanton Streets run one way (forever it seems) and Collins (Little Collins), Bourke (Little Bourke) the other. There’s only one proviso, that you do not enter David Jones or Myers while negotiating the grid or you will depart from one of the stores into the wrong street and find yourself walking uphill instead of down and wondering why. Ah, but even Katherine Mansfield I think would have found it difficult to side-step the mid-season sales at David Jones with 50% reductions! And before I segue too far, just one extra plug for the Melbourne City Library on Flinders Lane where they offer FREE computer access for one hour a day for a month, to visitors. The room was full of all sorts of people and all of them had their screens open on their facebook page. Would Katherine have enjoyed this – chatting on-line to Middleton-Murray from Menton, do you think? Let me confess right up front that I am a mere enthusiast and not an academic. I recently joined the Katherine Mansfield International Society and it was through their newsletter that I saw the Symposium was to take place. It seemed like the perfect opportunity to pursue both my passion for Katherine Mansfield and my love of Melbourne. I could never have conceived of the wide range of illuminating and fascinating approaches to the study of her work. The opening keynote address was by Professor Sue Thomas of La Trobe University exploring “Katherine Mansfield, Virginia Woolf and the Aesthetics of Respectability” which explored the relationship between these two writers, much written about and in particular, perhaps, the “snobbery, gossipiness and rivalry that made Mansfield retreat from Woolf and her circle.” This was followed by a speaker comparing Mansfield with the Australian modernist short story writer, Marjorie Barnard, while another speaker explored the literary links between Collette and Katherine Mansfield. Sarah Ailwood (one of the organisers of the symposium), from the University of Canberra, looked at the relationship between Katherine Mansfield’s ‘Prelude’ and the ‘Prelude to Christopher’, by Australian writer, Eleanor Dark. And, on it went, too many presentations to do justice and to detail them all, but including, Anna Jackson from Victoria University who told a charming story of Ida Baker being summoned to secrete a favourite chair out the fire escape of KM’s London dwelling in the middle of the night, when KM and Middleton Murray were down on their luck and the repossession man was due. I love this image of unquestioning friendship, the loyal Ida Baker creeping precariously down the fire escape clutching KM’s favourite chair. Thanks to the generosity of the organisers of this symposium, Dr Sarah Ailwood, University of Canberra and Dr Melinda Harvey, RMIT, I was somehow drawn into participating in the Symposium and invited to be the Chair to introduce Penelope Jackson, Curator of the Tauranga Art Gallery, New Zealand who gave a most entertaining visual presentation about Katherine Mansfield as a subject for the portraitist. 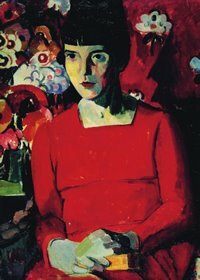 She told us that the very famous Anne Estelle Rice portrait of Katherine Mansfield (in the red dress) now held in the Te Papa collection, when first painted, was first offered to the British National Gallery, who declined this offer. Penelope Jackson read from a letter that Virginia Woolf wrote to the Gallery about the portrait urging them to accept it, even though she herself had not seen it. Another little gem really that highlighted the social gap between the two women. Penelope Jackson had generously organised replica portraits by famous New Zealand artists to be displayed in the room where we all gathered each morning for coffee and during the breaks for pots of tea (a large red tea pot on the table, irises in a vase, and delightful miniature brightly-iced cup-cakes) – everything possible was done by the local RMIT staff and students to evoke a sense of KM. I was most intrigued to meet Richard Carr, Associate Professor of the University of Alaska Fairbanks whose presentation was on ‘The Male World in Katherine Mansfield’s Fiction’ and in chatting with Richard during the coffee breaks I was astonished to learn that he taught New Zealand literature in Alaska, in particular, Witi Ihimaera, Patricia Grace, Alan Duff, and Ronald Hugh Morieson (so, how about that!) – I told him about Alice Tawhai and Owen Marshall, and he was keen to know more. Then, at the very last session before the keynote address by our very own Emeritus Professor Vincent O’Sullivan of Victoria University, we heard from three Honours students from the RMIT, (students of Dr Melinda Harvey), and it was refreshing and impressive to listen to their confident, passionate and interesting presentations. Professor Vincent O’Sullivan (pic left) wrapped up the two-day seminar with a most insightful, carefully construed and empathetic interpretation of Katherine Mansfield’s final days at Gurdjieff’s Institute at Fontainebleau - the fact that this ending of her life in his words “continues to be an awkward biographical fact for many who write on her.” Professor O’Sullivan seemed to imply that Katherine in choosing this particular place to be at that time, was finally, heroically (bravely), meeting life and death on her own terms. . He discussed why she was drawn to Lewis Wallace’s ‘Cosmic Anatomy’, a detail that he says most biographers tend to avoid because they cannot explain it. And then he added the delicious detail that Katherine was known to carry around a copy of the bible, the work of Shakespeare, a pistol and a fan. And, in conclusion, the thing, the very thing that struck me so at this symposium, was the amazing line-up of young Australians (primarily women) who are so engaged with the reading and study of our darling KM. Add to this the fact that in 2010, if you explore Australian bookshops, there are barely any Kiwi writers, and vice versa on our New Zealand book shop shelves, very few Australian writers – it seems we do not cross fertilise that well in the modern world, but that retrospectively, Katherine Mansfield, yet again, has cemented her reputation as a a very modern woman. Reviewer Maggie Rainey-Smith is a Wellington novelist/poet/bookseller and regular guest blogger on Beattie's Book Blog.